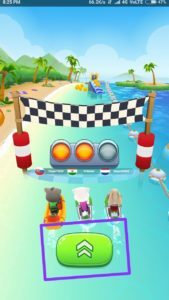 In Talking Tom Jetski 2, your objective is to beat the rivals and get the 1st rank in jetski race. The way to victory is full of obstacles, boosters, accelerators, and you have to keep an eye on all things. 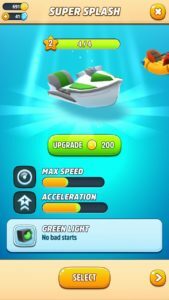 Dodge the obstacles to maintain your current speed, pass through accelerators to accelerate your Jetski’s speed, and collect boosters to power-up your character or for double fun. At the beginning of the game, except Tom, every character is locked. How to unlock characters in Jetski 2? There are two ways to unlock locked characters; you can spend gems[not recommended] or build the beach resort. For this purpose, you have to collect gold coins by playing the game. To switch to one of these worlds, just swipe right on the main screen. 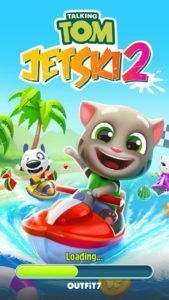 You can collect up to 17 unique Jetskis; from the fast ‘n’ fierce Tiger Rider to Pink Sparkle, the unicorn Jetski. At the beginning of the game, you have Super Splash, Big Air, Pink Sunrise, and Rubber Duck. The player can obtain or unlock new Jetskis by opening the chests. You get these chests by winning the race. 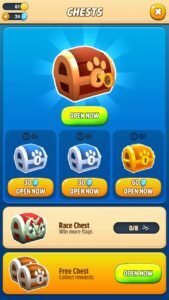 These chests contain gold coins, Jetski cards, diamonds. You use Jetski cards to upgrade your Jetski, diamonds to open the chest, gold coins used in upgrading the Jetski or for building the buildings; resort, lab, and more. The gameplay; You just hold down your thumb on the screen and swipe right/left to navigate your character. All you need to do is pass through accelerators, dodge obstacles, collect the power-ups/boosters, and increase the speed of your Jetski. Tip 1.) Use the accelerator button for a good start. A good start is a key to get the first rank. One of the best ways to accelerate the Jetski is by tapping on the accelerator button when it turns all green. This will give you a good start and you will be able to collect all those boosters first before your rivals. Note; don’t tap on the accelerator button instantly. Wait until it turns to green, otherwise, you will not be able to accelerate the Jetski’s speed. Go to your mobile settings and set the date for next day. After it, go back to the game -> chest section -> BOOM!!! you can now open the chest! Claim all of your free chests, play the game, win the race, and claim the race chest. To win a race, one main thing that matters a lot is the maximum speed of your Jetski. You can not beat the rivals with a downgrade Jetski. So, upgrade your main Jetski, spend coins. Upgrading increase the maximum speed and accelerator speed. 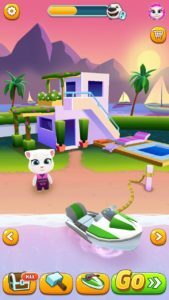 Each Jetski in Talking Tom Jetski 2 game has its own unique feature. For example, if you choose Rubber Duck Jetski, then wooden obstacles would not affect your speed. If you choose Big Air Jetski, then you would stay in the air longer. In short, choose the Jetski wisely; with maximum speed, acceleration, and best feature! If your Jetski’s speed is slow, then you can not beat the rivals in Talking Tom Jetski 2 game. Read the first tip on this list and then follow this tip; if your start is good and you are ahead of the rivals, then collect all those power-ups[don’t leave for your rivals]. The speed is important; pass through the accelerators every time to increase the speed of the Jetski.